Deepak Chopra says extremists could be reacting to Barack Obama's gestures toward Muslims. 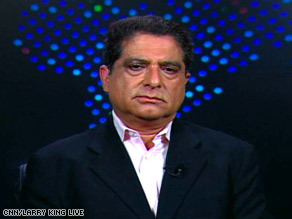 CNN's Larry King spoke with author Deepak Chopra about the situation. Larry King: Let's go to Dr. Deepak Chopra, the physician, philosopher. His new book is "Jesus: A Story of Enlightenment." Where were you born in India, Deepak? Deepak Chopra: I was born in Delhi, but I have been in these hotels many, many times. I have stayed there, so I know the scene; I know the restaurants. I have been trying to get in touch with my friends and relatives, some of whom I have spoken to, some of whom I can't speak to. The lines are jammed. We're texting each other. A friend of mine from Egypt was in the restaurant at the Taj hotel when the firing started, and somehow she managed to avoid the fray, hid in a basement and is now holed up in a room which is right next to the Taj hotel and is waiting to be told what to do. The situation is complex, Larry, because it could inflame to proportions that we cannot even imagine. It has to be contained. We now recognize that this is a global problem, with only a global effort can solve this. And you know, one of the things that I think is happening is that these militant terrorist groups are actually terrified that [President-elect Barack] Obama's gestures to the rest of the Muslim world may actually overturn the tables on them by alienating them from the rest of the Muslim world, so they're reacting to this. You know, this is Obama's opportunity to actually harness the help of the Muslims. You know, there's 1.8 billion Muslims in the world. That's 25 percent of the population of the world. It's the fastest-growing religion in the world. We cannot, if we do not appease and actually recruit the help of this Muslim world, we're going to have a problem on our hands. And we cannot go after the wrong people, as we did after 9/11, because then the whole collateral damage that occurs actually aggravates the situation. In India, this is particularly inflammatory, because there's a rise of Hindu fundamentalism. We saw what that did in Gujarat, where, you know, Muslims were scorched and they were killed, and there was almost a genocide of the Muslims. India has 150 million Muslims. That's more Muslims in India than in Pakistan. So this is an opportunity right now for India and Pakistan to recognize this is their common problem. It's not a Muslim problem right now; it's a global problem. King: Do you think that this is just the beginning, that there's a potential impact, or more? Chopra: There is a potential impact of a lot more carnage. But it can be contained. And right now, one of the questions, you know, after I heard Barbara Starr talking about how coordinated this is, that there are militant groups that cross international boundaries, is who is financing this? Where is the money coming from? We have to ask very serious, honest questions. What role do we have in this? Are our petrodollars funding both sides of this war on terrorism? Why are we not asking the Saudis where that money is going that we give them? Is it going through this supply chain to Pakistan? It's not enough for Pakistan to condemn it. Pakistan should cooperate with India in uprooting this. They should be part of the surgery that is going to happen. It's not enough for Indians to blame Pakistanis. Indians should actually ask the Pakistanis to help them. And it's not enough for us to worry about Westerners being killed and Americans being killed. Every life is precious over there. We have got to get rid of this idea that this is an American problem or a Western problem. It's a global problem, and we need a global solution, and we need the help of all the Muslims, 25 percent of the world's population, to help us uproot this problem. King: What does India immediately do? Chopra: India at this moment has to contain any reactive violence from the fundamentalist Hindus, which is very likely and possible. So India has to condemn that by not blaming local Muslims. They have to identify the exact groups. And the world has to be very careful that they don't go after the wrong people. Because if you go after the wrong people, you convert moderates into extremists. It happens every time, and retribution against innocent people just because they have the same religion actually aggravates and perpetuates the problem. Chopra: I think Mr. Obama has a real opportunity here, but a challenging opportunity, a creative opportunity. Get rid of the phrase "war on terrorism." Ask for a creative solution in which we all participate. King: Is it because the war on terrorism really can never be won because the terrorists (inaudible)? Chopra: Because it's an oxymoron. It's an oxymoron, Larry, a war on war, a war on terrorism. You know, terrorists call mechanized death from 35,000 feet above sea level with a press of a button also terror. We don't call it that, because our soldiers are wearing uniforms. They don't see what is happening, and innocent people are being killed. So, you know, terror is a term that you apply to the other. King: Thanks, Deepak Chopra, as always, extraordinarily enlightening.